Hello ! In this post, I will explain how to add a new schema into OpenLDAP 2.4 and higher. Why ? Because since release 2.4, the structure of the server has a little changed. I’m not an LDAP expert but I’m writing this article because I insulted my OpenLDAP and my Linux several times during one week while I try to add my own schema into OpenLDAP 2.4. I have read a lot of posts but honestly, I never find a good “how-to” which respond to the question in this post’s title. 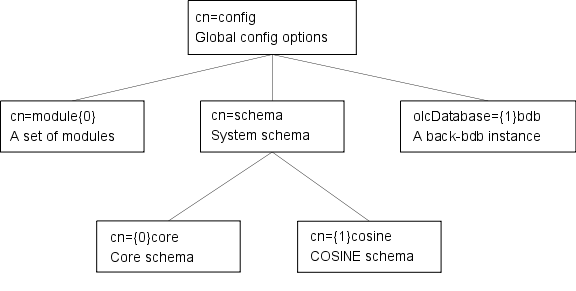 We can look that schemas must be placed as child of cn=schema,cn=config. Before the release 2.4, all .schema (stored under /etc/ldap/schema/) were included into slapd.conf. Since 2.4, we must “forget” the .schema file. The best way to explain how to add new schema with 2.4 (and higher) release is to start with a real and practical example. I suppose you already have a OpenLDAP server running. For your information, my OpenLDAP runs on a Ubuntu Server 12.04 LTS with a 3.5.0-48 64 bits kernel. For this example, we can imagine that we want to add a new schema with a custom objectClass for our business application. This new objectClass has the name of nsaEngineer and the schema nsaProject. As a reminder, a schema is a container (package) for one or many objectClass. An objectClass contains references to other objectClass and attributes. Now, the objectClass nsaEngineer has 3 customs mandatory attributes and a optional (description) which is referenced in another base schema. The .schema format is simple to understand and to write for the beginners. Let’s start by creating a working directory for example /tmp/ldapworkingdir. Now, create the file nsaProject.schema which contains the definition of the new and custom attributes and the new objectClass nsaEngineer and save it in /etc/ldap/schema/. I will not explain in detail the content of nsaProject.schema because it is out of the scope for this post. Now it’s time to try to convert our .schema into an LDIF file and add it to OpenLDAP. To begin, create a dummy file into /tmp/ldapworkingdir called ldap.conf for example and write into it the include directive to the nsaProject.schema. root@ldapserver:/tmp/ldapworkingdir# slaptest -f ldap.conf -F .
You must keep only the following things and delete the rest. Note : I will write a program that will make the whole procedure automatically;-) Stay tuned! Extremely helpful but please fix your keywords or make something to get this post more visibility on google. I’ve been searching for this exact info ( how to make the schema object+attributes ; convert it correctly to ldif; import it in my ldap ) and none of my searches for “how to add custom schema” or “how to add new custom schema” or ” how to add new schema” to ldap helped me. Anyway, you came just when everything seemed lost and I sincerely thank you ! Hello Tsouica and thank you for your advice ! I understand your problem because when I searched myself to understand how to add/create/modify schema on Google and friends, I had a lot of problems too. It is why I created this article after. The name of my post must be simple and short but maybe I must add some “search keywords” to help indexing by bots. Don’t hesitate to contact me if you have suggestions, advices and so on. nice article and helpful, but, where did you get those OIDs? What password is it asking for? Hello Tracy. It asks for LDAP password needed to connect to your LDAP server. Dude, you saved my life. Was struggeling few days with it. Its unbelievable that there is no possibility to do this with a gui tool like apache directory studio or similar.